Solar street light (SSL) are extensively being used for outdoor street lighting as their primary source of energy is solar power. With no dependence on conventional sources of energy, these lighting mediums operated on stand-alone mode, eliminating the need for a general grid of any power requirements. The standalone solar photovoltaic street lighting system comprises of a re-chargeable lead acid battery for storage, PV (photovoltaic) modules for charging the battery, light source (compact fluorescent lamps (CFL), and light emitting diodes (LED), suitable electronics for the operation of the tamp, and safe charging and discharging of the battery and mechanical hardware for fixing these sub systems. The key advantage of these lighting systems is that they available either with automatic dusk to dawn operation or with a pre-set timer. Tubular batteries provided with the solar street lighting systems require exceptionally low maintenance and are known to have a long life. In light of these advantages, the global solar street lighting market is likely to be worth US$22.30 bn by the end of 2025 from US$3.47 bn in 2016. During the forecast period of 2017 and 2025, the global solar street lighting market is expected to progress at a CAGR of 23.4%. The applications of solar street lighting solutions are seen in areas such as residential, commercial, and industrial. Of these, the commercial segment is projected to lead the global market due to rising initiatives by governments and civic authorities to using solar lighting. Currently, solar street lighting solutions are being used on streets, roadways, and various other commercial establishments. Analysts expect that the commercial segment of the global solar lighting market is likely to acquire a share of 68.2% by the end of 2025. The growing demand for solar lighting in areas such as parking lots, pathways, subways, perimeter security lighting, and public area lighting have also augmented the growth of this segment. The rising awareness amongst global citizens about the burden of using traditional lighting sources has significantly made them transition to greener solutions. Asia Pacific was the largest market for solar street lighting globally, accounting for 44.3% share in 2016. India was the leader in terms of revenue, closely followed by China, in 2016. On the other hand, the Middle East and Africa was the second-largest market for solar street lighting in the same year. Kenya, South Africa, Ghana, and Nigeria spearhead the solar street lighting market in Africa with need for clean and reliable source of off-grid electricity. Europe stood third with Germany and the U.K leading the demand as the region makes a serious shift towards greener solutions. Analysts expect that is likely to witness significant growth in the near future and would surpass the growth rate of Asia Pacific market by 2020. This expected growth is the result of numerous initiatives such as subsidies, campaigns, and different programs introduced by the World Bank and International Finance Corporation to promote solar street lighting products. Some of the key players operating in the global solar street lighting are VerySol GmbH, Philips Lighting Holding B.V., Bridgelux, Inc., Omega Solar, Dragons Breath Solar, Solektra International, SOKOYO Solar Group, Sunna Design, Solar Street Lights USA, Urja Global Ltd., and Sol, Inc. Outdoor Street lighting units used to illuminate a street or open areas via solar energy is termed as solar street light (SSL). Since their primary energy source is solar power, they operate in a stand-alone mode, therefore are not dependent on the general grid for any power requirements, whatsoever. Due to their dependency on sunlight, the lighting unit needs to be installed in a shadow-free area or a place where direct sunlight is available throughout the day to sufficiently charge the batteries for one working cycle. The standalone solar photovoltaic street lighting system comprises of a re-chargeable lead acid battery for storage, PV (photovoltaic) modules for charging the battery, light source (Compact Fluorescent Lamps (CFL) and Light Emitting Diodes (LED), suitable electronics for the operation of the tamp and safe charging and discharging of the battery and mechanical hardware for fixing these sub systems.. 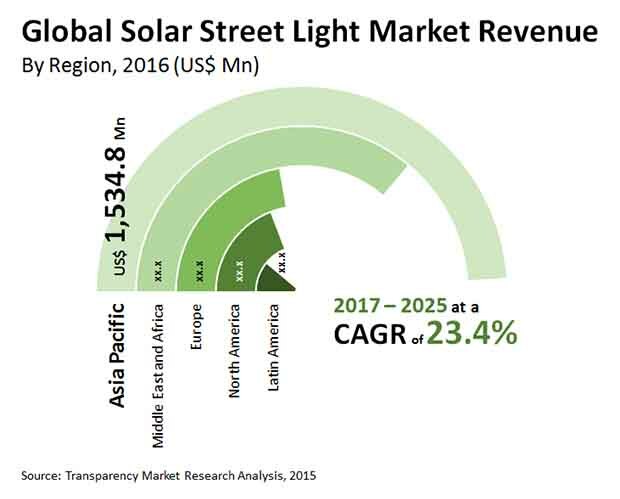 The report provides in-depth analysis and forecast of the solar street lighting market on the global as well as regional level. The report includes forecast for the period from 2017 to 2025 in terms of volume (Mn Units) and revenue (US$ Bn). Quantitative data has been derived through extensive secondary research of the global solar street lighting market. Secondary sources typically include company websites, relevant magazines, government documents, and press releases. The top-down approach has been adopted to derive the regional numbers from global revenue and volume figures. Furthermore, the bottom-up approach has been employed to derive data for various technology type and end-use sectors based on demand for solar street lighting in each geographical segment. A combination of top-down and bottom-up approaches helps in validation of the quantitative data of the market. The data was further validated with the help of primary research with industry experts to ensure accuracy of derived numbers. Detailed analysis of various factors driving the global solar street lighting market has been included for astute decision making. Impact of these drivers during the forecast period has been included with data to substantiate research findings. Furthermore, factors restraining market growth have been included for better understanding of the market. Impact of these restraints has been analyzed over the forecast period. The report also comprises various opportunities available for market growth over the next eight years. Opportunities entail untapped or recently explored factors that are anticipated to drive the solar street lighting market during the forecast period. The report includes value chain analysis to help understand the industry thoroughly. Value chain analysis comprises detailed evaluation of the roles of various entities involved in the solar street lighting industry, from raw material suppliers to end-users. Porter’s Five Forces model has been included to determine the degree of competition in the market during the forecast period. Furthermore, market attractiveness analysis has been conducted to analyze application segments that are expected to be lucrative during the forecast period. This is based on various factors such as market size, growth rate, profitability, raw material procurement, and competition in each application segment. Based on type, the solar street lighting market has been segmented into standalone and grid. Based on Lighting Source, the solar street lighting market has been segmented into LED and CLF. And based on Application, the solar street lighting market has been segmented into Residential, Commercial, and Industrial. The report comprises detailed analysis of all the segments in the regional and global markets and forecast based on current and future trends in the industry in terms of volume (Mn Units) and revenue (US$ Bn). In terms of region, the market has been segmented into North America, Europe, Asia Pacific, Latin America, and Middle East & Africa. Demand for solar street lighting in each type, lighting source and application has been analyzed and forecast for a period of eight years. The report also comprises profiles of leading companies in the solar street lighting market. These include Philips Lighting Holding B.V., Omega Solar, Bridgelux, Inc., Dragons Breath Solar, SOKOYO Solar Group, and Solektra International. Various attributes of these companies such as company overview, business strategies, and recent developments form the core of the company profiles section.